The tongue-in-cheek style adds a bit of humor to this murder mystery story, which isn’t just a story of a wealthy widow in a dysfunctional family who believes a mystic can contact her dead husband through a seance and he in turn can help her put order back into her life. The second half of the book provides the information and instructions needed to perform this story in play format in the privacy and comfort of your home. There are many characters so all guests can participate and experience stepping into a different persona, if only for an intriguing evening of murder…starring YOU! 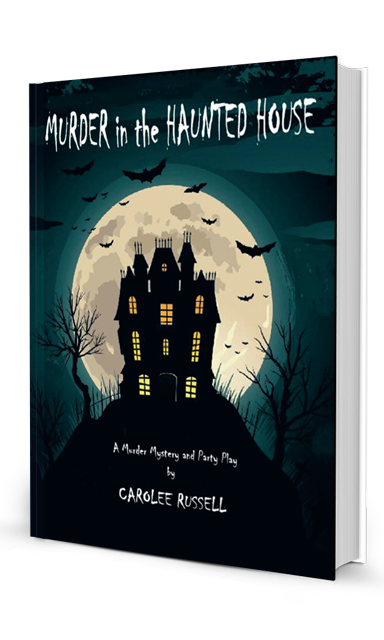 With the publication of Murder in the Haunted House, Russell brings to the public not only the conceived story but also full instructions and the means to perform the story as a play in a party atmosphere. Be daring, let yourself go and give it a try. Look for other similar mystery party plays coming soon: A Race to Murder, Murder By Magic and A Wake For Murder. Copyright © 2013. Carolee Russell	. All rights reserved.